Can Eating Granny Apples Help Flatten Your Stomach? Your stomach is one of your body's favorite locations to store excess fat. Staying active and eating a nutritious, low-calorie diet can help reduce such fat stores. Granny Smith apples are a smart addition to a healthy diet for several reasons. 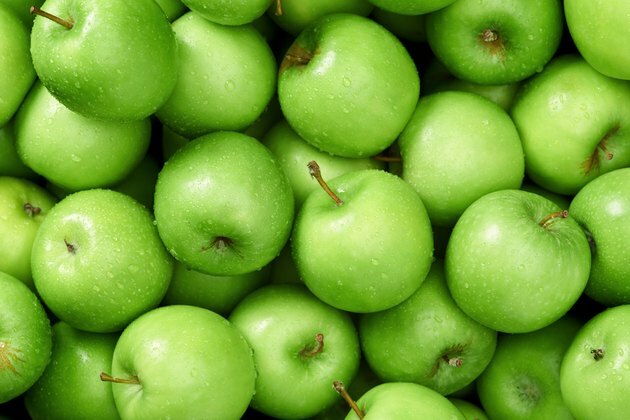 Granny Smith apples contain only about 80 calories each. Particularly when you leave the skin on, Granny Smith apples also contain a lot of natural fiber, vitamins, minerals and antioxidants. They are a nutritious, healthy snack, which helps with weight loss and management. Additionally, apples' fiber content helps promote healthy, efficient digestion, which also contributes to weight loss. The health benefits from eating Granny Smith apples may help you resist and fight cancer. According to the "Huffington Post," eating apples regularly can reduce your risk of lung cancer by up to 50 percent, colon cancer by up to 43 percent and liver cancer by up to 57 percent. Cholesterol levels tend to be lower in those that eat apples as well, which translates to a lower risk of heart disease, stroke and blood pressure disorders. In addition to the nutritional value of Granny Smith apples and the bonuses they provide to your immune system and disease resistance, they have some extra benefits that are primarily external. For example, the acid in apples can help keep your teeth and gums clean and healthy. The "Huffington Post" also reports that apples are known to benefit your skin's health and to reduce the appearance of wrinkles. Granny Smith apples are a tart apple with green skin is equally popular for eating raw, as a sauce or baked into pies and cobblers. According to a 2009 article by "Irish Health," Granny Smith apples have been shown to contain a higher level of beneficial antioxidants then any other variety of apples. Granny Smiths also are known for being a long-lasting, durable apple -- this means that it retains nutritional value for longer after picking than do many other varieties of apples.